It’s not recommended to use a big air conditioner for cooling just a small room. Because if your air conditioner has a bigger BTU rating than the room size needs, it will cycle off too quickly, waste energy, and will not adequately dehumidify the space. For cooling a small room (100 to 250 square feet), your air conditioners should range from 5,000 to 6,500 BTU/hr cooling capacity. A 5,000 BTU air conditioner is the best option for cooling a room that less than 150 square feet, while a 6,000 BTU air conditioner is designed for cooling a room measuring from 150 to 250 square feet. 6,000 BTU air conditioners fall into 2 main categories: window units and portable units. Window air conditioners are the most popular type in American homes. These units are the most efficient and least expensive, usually cost less than $200. Portable air conditioners are intended for homes in which window configurations or building regulations prevent installation of window units. They are much more expensive and use more energy than window units. What’s the quietest window AC you can buy? 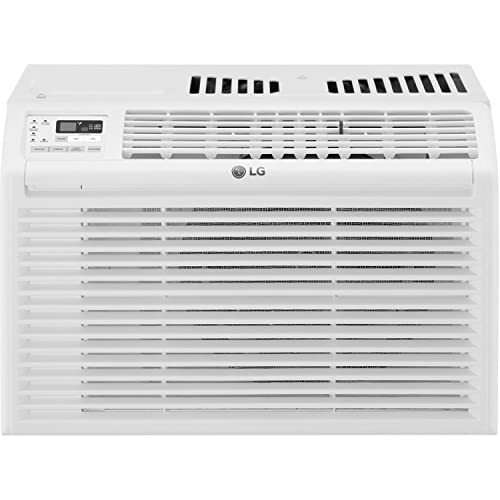 The LG LW6017R is the best 6,000 BTU window air conditioner for small rooms that money can buy. It comes with 3 cooling and fan speeds that can cool up to 260 square feet, you can be sure the heat will be no problem. This product has a very high rate of moisture removal at 1.8 pints per hour, which makes it great if you live in a humid climate. This window AC cooled and dehumidified our testing room quickly that makes a room more comfortable in a very short amount of time. At just 54 dBA the LG is quieter than other air conditioners of the same BTU rating. Many window air conditioners on the market generate more than 60 dB. This unit isn’t only quiet, it’s also energy-efficient. The impressive 11.5 energy efficiency rating (EER) means it is designed to use every watt effectively. The best window air conditioners have an EER of 10 or greater. A remote control is included with this product, and it allows you to easily adjust the settings and temperature of your window air conditioner from across the room. The remote features numerous setting options, a timer and a power button. Some other great features such as 24-hour on/off timer, sleep mode and an Energy Saver function. The drawback of this product is it doesn’t meet the latest Energy Star standards, which require them to use 15 to 20 percent less energy than units without that certification. But if you don’t care about this feature, this unit is one of the best 6,000 BTU air conditioners that you can buy. The Haier HWR06XCR is one of the smallest and lightest window air conditioners on the market. With an affordable price and an extremely good quality, this unit becomes the best-selling window AC in US. With 6,000 BTU cooling capacity, this unit is a perfect addition to a room up to 250 square feet. It also can remove 1.6 pints of moisture per hour, less than the LG but still above average for fighting humidity (1.4). The best feature of the Haier HWR06XCR is that the unit is programmable. It’s very convenient because you can program the air conditioner to turn on about a half an hour before you I get home from work, you can walk into a room that is already comfortable and cool. This way the unit is not running all day and wasting energy cooling your home for no reason. Keeping cool is essential. But what isn’t essential, is the piling electricity bill at the end of the month. 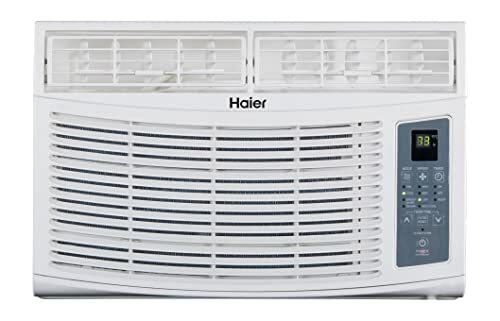 Finding an efficient and effective window air conditioner is relatively easy, but the Haier HWR06XCR takes it several steps further. This unit is perfect for keeping everyone comfortable on those long summer days. Friedrich is one of the most trusted brands in the world and they are USA based manufacturer. Friedrich’s Chill line of window air conditioners are the world-class options. The Friedrich Chill CP06G10B is a good product with many benefits. It provides enough power to cool up to 250 square feet, features four-way airflow for even air distribution, 3 cooling and fan-only speeds and includes an energy saving mode to help cut energy costs and save you money. But it’s much more expensive than others in our lineup. In fact, this unit is too pricey for our top spot. However, if you’re looking for a window air conditioner to use in your bedroom, this unit just may be what you’re looking for. This unit is an Energy Star qualified device, which means it uses 15 to 20 percent less energy than units without that certification. Furthermore, it’s a perfect addition to your small bedroom, because it runs very quiet. In our test, this unit generated less than 50 dB on the lowest fan speed setting, which means it’s quieter than many other air conditioners. This Friedrich air conditioner can be installed in standard vertical sash windows or through a wall. The AC comes with installation hardware for each type. For flexible integration into your environment, this window AC includes a 6-foot, 115-volt power cord that runs either left or right through the side of the AC cabinet. 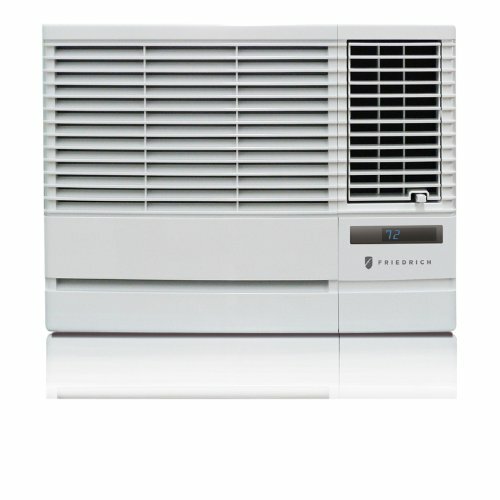 Although the Friedrich Chill CP06G10B is too pricey, it’s a very good option to consider for a 6,000 BTU air conditioner. With a variety of great features, it’s worth every penny you spend on it. If you’re looking for an energy-efficient window air conditioner, this 6,000 BTU unit is the best option you can buy. It has an Energy Star certification, which is one of the first signs of a great window AC. Energy Star products are generally 15 to 20 percent more efficient than what is required by law. Plus, the impressive 12.2 energy efficiency rating (EER) of this unit is the highest number in our comparison. The estimated annual energy cost for this unit is low compared to other window air conditioners. Meaning that it cools your room quickly without enormous energy bills. The Frigidaire FFRE0633S1 is perfect for cooling a room up to 250 square feet. It comes with features such as a remote control, a timer, and a variety of modes for your convenience – including sleep mode, energy saver mode, and dry mode. Although it’s not the quietest, it runs fairly quiet on the low setting and a bit louder on high. The multi-speed fan features three different speeds for cooling flexibility and the 8-way comfort control design allows you to easily control the direction of the cool air, wherever the unit is mounted. This window air conditioner is one of the most compact units on our lineup. It weighs only 44 pounds, making it one of the lightest room air conditioning units we reviewed. Many cooling units with 6,000 cooling capacity weigh more than 60 pounds (such as the Friedrich Chill CP06G10B above). This product is also only 13.4 inches tall, 18.5 inches wide and 15.5 inches long – which is relatively small when compared to other units. 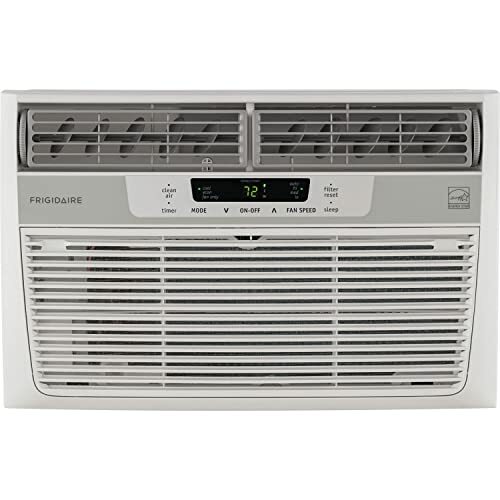 Overall, if you want a 6,000 BTU window air conditioner that is compact, energy-saving and powerful, the Frigidaire FFRE0633S1 is one of the best options available for your home. 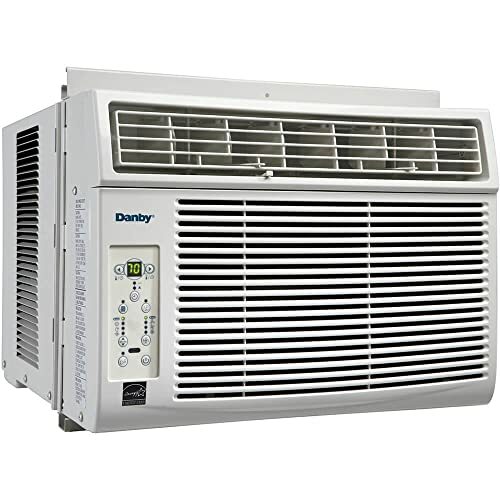 The main purpose of an air conditioner is to cool down a room, and the Danby 6,000 BTU window AC accomplishes the task as well as any of its peers. This unit is very good at cooling a room and relatively quiet on the low setting but noisier on high. This unit has all of the operation modes you could want to help you stay cool in a number of different scenarios. With energy-saver mode, once your set temperature is reached, the compressor turns off and only the fan runs until the room temperature rises above your set temperature, reducing energy usage. For quiet and energy-efficient operation, turn on this mode while you sleep. The temperature will raise a few degrees and be maintained for 6 hours using a low fan speed, which ensures your AC doesn’t “over-cool” at night. This unit also comes with programmable mode that allows setting your AC to turn on or off in 30-minute intervals up to 24 hours in advance, ensuring your AC only runs when it’s needed. The energy efficiency ratio (EER) of 12.1 is higher than many other window AC units on the market (but lower than Frigidaire FFRE0633S1), so this unit could easily save you some money on power bills over time, especially if you are replacing an older unit. This unit is rating at 6,000 BTU cooling capacity, but in our tests, it wasn’t as powerful as 4 options above. You should only use it for cooling a room of approximately 200 square feet. However, it’s powerful enough for keeping everyone comfortable in the room. Plus, this unit is relatively quiet on the low setting, so it’s perfect choice for the bedroom. 6,000 BTU portable AC units aren’t as popular as window AC units. They’re also more expensive, weaker and tend to be noisier. 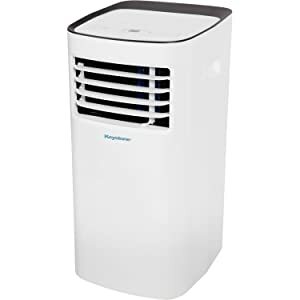 But if you want to buy these units, the Keystone portable air conditioner may be the best option. This unit is designed for a small room: 200 square feet. While many portable air conditioners on the market make much more noise when operating, the Keystone is practically silent at 50 dB on low setting. Meaning that this unit is perfect for use in the bedroom, helps you get a good night’s sleep. Omni-directional Casters roll the unit easily from room to room wherever you need relief. Plus, this self-evaporative unit includes a flexible exhaust hose and window venting kit for quick and easy setup. This portable air conditioner has a programmable timer mode. You can set it to start a cooling cycle before you arrive home from work or to shut off before you go to sleep. It also features with a remote control, 2 cooling speeds and 2 fan speeds and 3 setting modes to keep you comfortable.